If you’ve always reserved butternut squash for roasting and soups here is a new recipe for you. I’ve never been a huge fan of coleslaw, usually its too sweet and so laden with dressing that it’s a soggy mess. This is a version of coleslaw that I can really get into, sweet, crunchy and utterly refreshing. 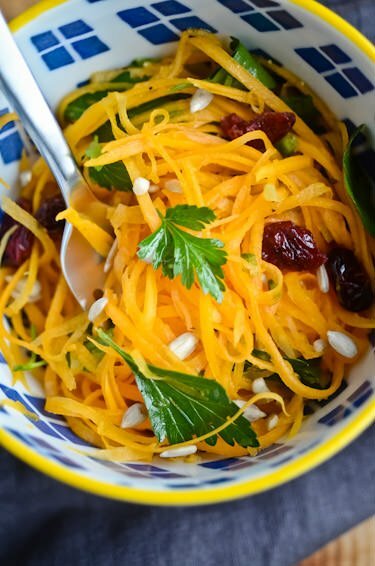 Butternut squash julienned into whisper thin slices, dressed lightly with a sweet vinaigrette and topped with cranberries and sunflower seeds it’s the perfect alternative to any slaw. It’s low calorie, chock full of nutrients and vegan so it makes the perfect potluck or party salad to take along. If you don’t have a julienne slicer use a large box grater instead, it won’t be quite as pretty but will still be delicious! If you don’t need it to be vegan a little crumbled feta or goat cheese would make it more substantial and be a nice counterpoint to the sweetness. A perfectly light side for Fall weather this butternut squash slaw couldn't be easier to put together! 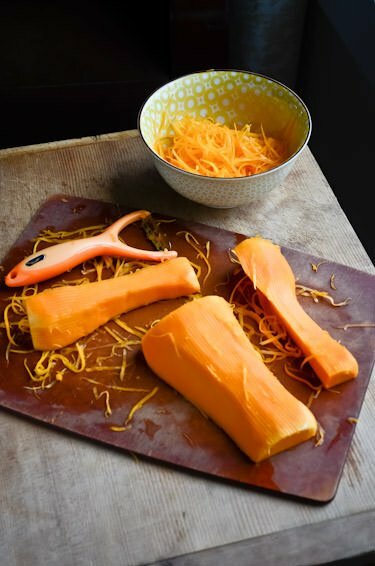 Peel the butternut squash, use a box grater or julienne peel to get 3 cups of butternut and place in a medium sized bowl. Combine the honey, apple cider vinegar olive oil and lemon. Season with salt and pepper, taste and adjust seasoning as needed, you may want to add more lemon or honey. 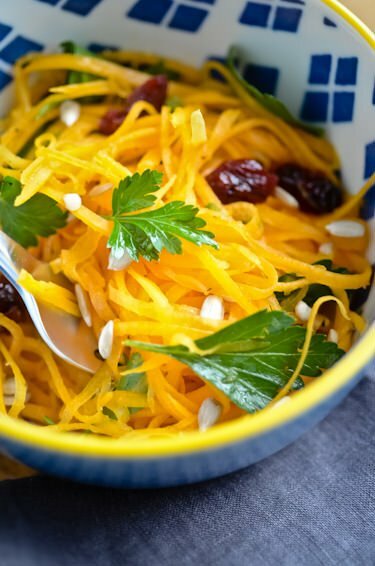 Add the parsley, cranberries and sunflower seeds to the butternut squash, top with the dressing and gently toss. 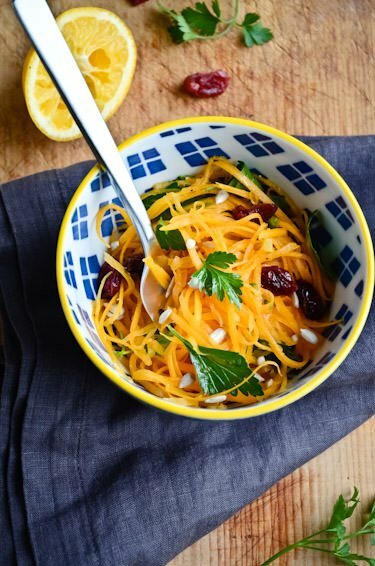 I originally clicked on this because I’m trying to figure out a good way to cook the spaghetti squash sitting on my counter (*sigh*) and that’s what the picture looked like. I’m wondering if it would work for this, don’t suppose you’ve tried it? This recipe won’t work with this type of squash but here is a a link to a recipe that I created specifically for spaghetti squash. If you want a version that isn’t vegetarian you could easily add a little sautéed sausage to the mixture. Hope it helps you figure out what to do with it! oops. Here is the link to the squash recipe. Made this today but substituted olive oil for coconut oil Was soooo good. You did forget on the recipe though to add the cranberries in the list of ingredients and the amount. Thanks for the great recipe though. I’m so glad you enjoyed the recipe! Thanks for letting me know about the omission, I will make sure to update the recipe! Just wanted to say that I made this tonight but the sore did not have sunflower seeds or parsley …. So i used pepitas and cilantro and it was amazing !!! 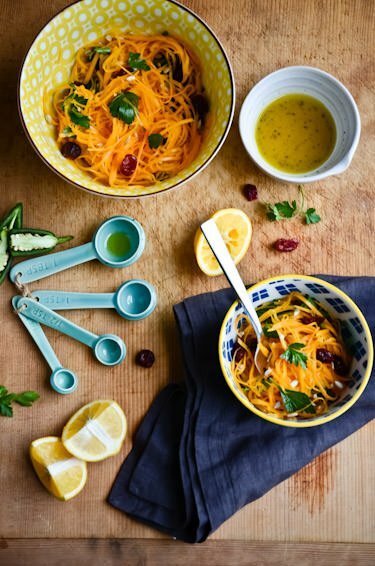 I just tried butternut squash in a salad like this last night and it changed my world! So happy I found this recipe–can’t wait to try! Just made this recipe and without it having time for the flavors to marry, I love it. My daughter who hates slaw loved this as well. I used cherries instead of cranberries. Delicious!! I’m so glad you enjoyed it! Cherries are a great option for the cranberries, fresh pomegranate seeds would also be a great and pretty choice! Thanks for trying the recipe!